Today we released this year’s annual Tax Freedom Day report – a calendar based look at the cost of government. 2012’s National Tax Freedom Day arrives on April 17th, but we also calculate a separate Tax Freedom Day for each state. Because taxes in the U.S. are generally progressive, higher income states tend to have later Tax Freedom Days, and lower income states have earlier Tax Freedom Days. 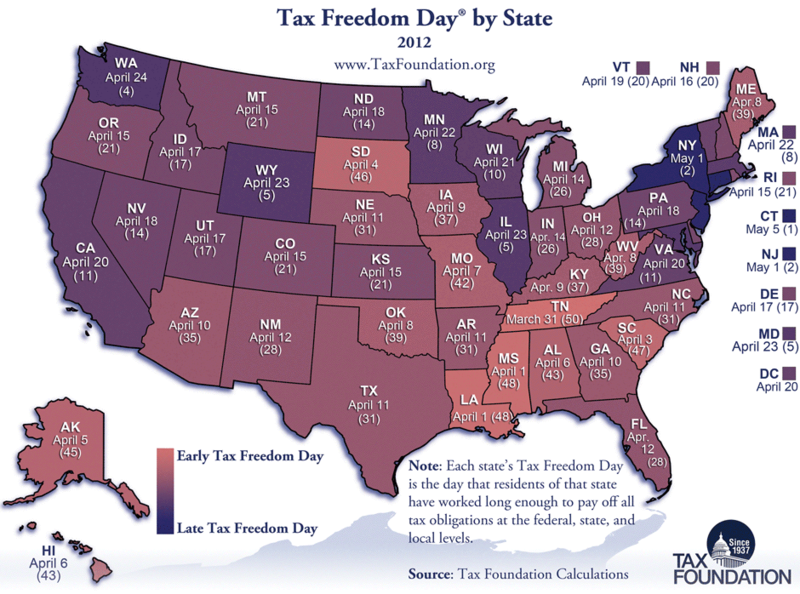 Today’s Monday Map shows the Tax Freedom Day for each state. Get your Tax Freedom Day gear (t-shirts, coffee mugs, and more) here.